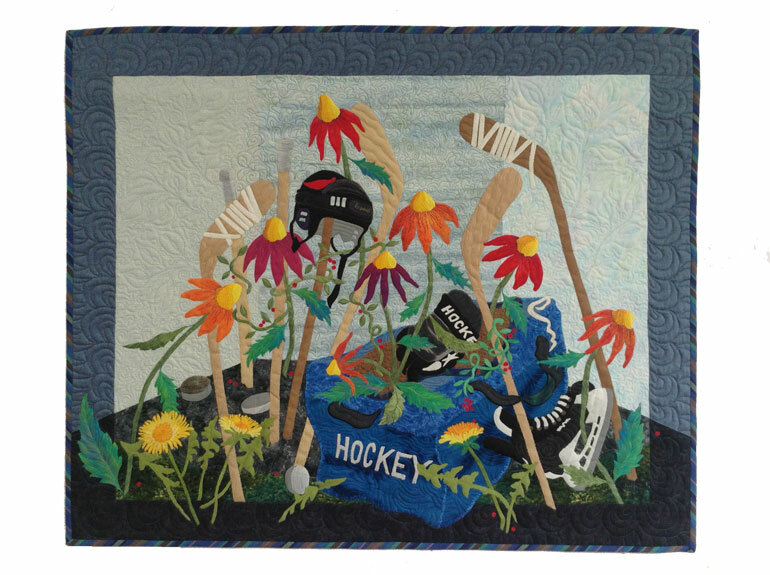 This quilt was made just for fun. 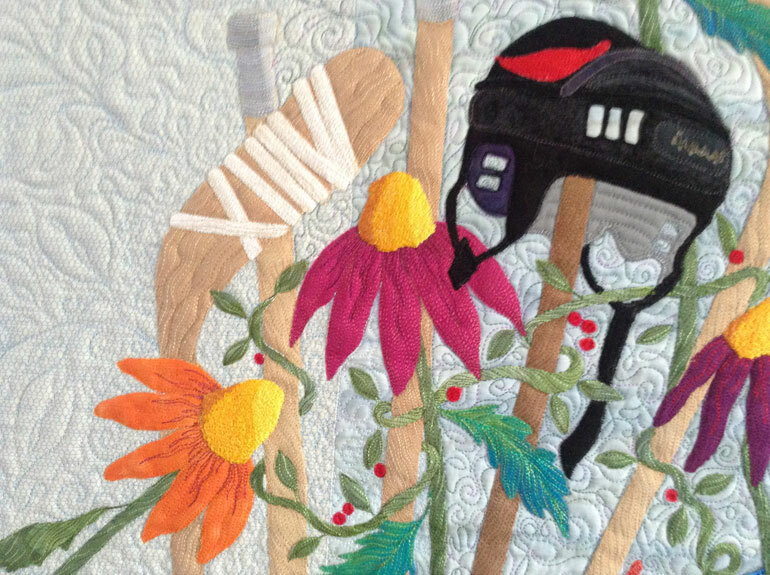 The idea was from my son Andy, who has been a hockey player for almost 20 years. Several years ago he asked me what could be done with some of his broken hockey sticks. I thought it would be a good idea to use them as stakes in my garden. Today, they are helping to hold up a large rose bush. If you don't have a hockey player in your family, you won't know about hockey bags. 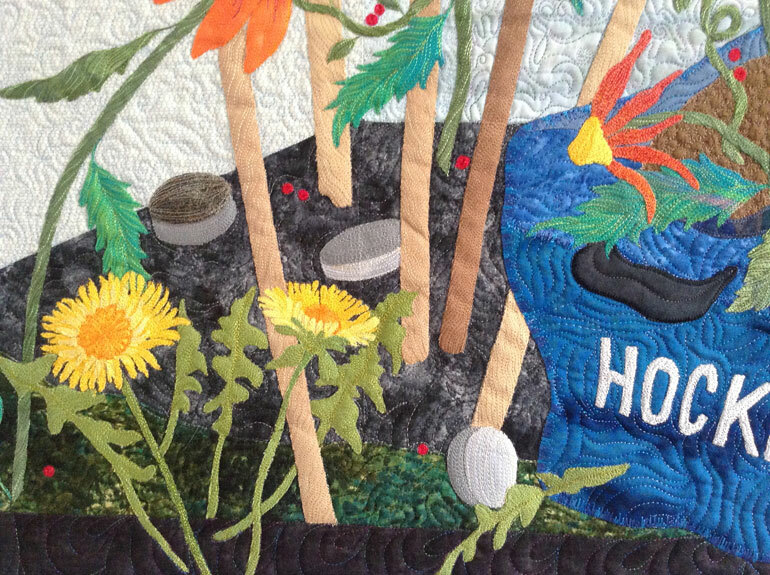 One is placed in the center of this quilt. They are really HUGE and the smell really bad. It is always difficult to deal with the odor problem of this stinky equipment, it doesn't even help much if you wash it! So I put a bag in the center of my little garden, surrounded it with some of the necessary equipment to hockey; sticks, tape, pucks, gloves, bag, helmet and the all important skates. There are also hockey pads, but there are inside the bag underneath the soil where some of the coneflowers are growing. It was fun to make this quilt. I pieced a room shaped background to give the garden some depth. 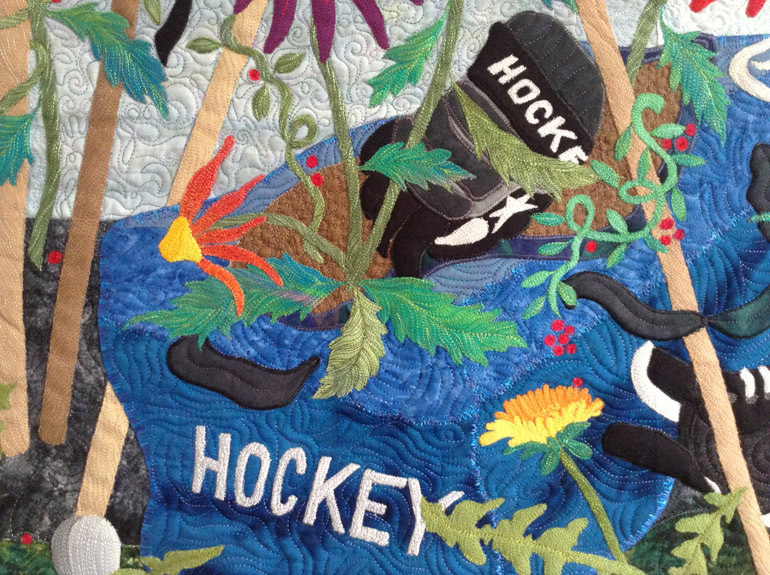 Then began placing all the segments which are fused, machine appliqued, embroidered and quilted. The border carries out the depth, by using two colors of fabric pieced at an angle. My husband Bob suggested that I put some dandelions in the garden, something 'weedy' to add a touch of reality. 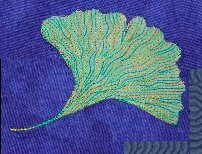 I used as many variegated threads as possible for all the stitching, wool batting is inside and a striped blue fabric is used for the binding on the outer edges. Breathe deeply, this hockey bag doesn't stink!